BORDERS: Must be made secure. WASN’T too sure how to scribble this week; light or heavy? Do I attract the ‘slings and arrows’ or go for a few laughs? The hell with it, I’m opting for heavy (surprise, surprise)! They sneeringly remark ‘Has the irony escaped you?’ after I have written some depreciating piece or commented on Europe and its immigrant problems. Well of course it hasn’t. I’m not a moron. I am an immigrant, and one with no regrets whatsoever. All those years ago, disillusioned and broke, with a career in ruins and a young family to support, in 1975 I left my beloved UK and made tracks for Saudi Arabia. There I worked my proverbials off for some eight years. When I had saved what I considered enough, and with nothing to attract me back to the UK, I looked around and with some encouragement from a good friend, decided to settle in Spain. I brought in some 40K (no small sum in ‘83!) became a resident and invested in a (failed!) business. I’ve had four children here and all have been educated in the Spanish system. I speak the language (could be better! ), have always paid my dues, and have integrated pretty well into the Spanish community. What I did not do, was to enter the country illegally, expect to be housed and paid benefits for doing nothing, insist that their schools fly the British flag or change their menu to suit my taste. I did not, create ‘no go’ areas, consider myself to be above local laws, mow down or slaughter innocent civilians while screaming ‘Jesus is great’ or scream racism when decisions didn’t go my way. I have nothing whatsoever against immigration. I truly believe diversity to be both healthy and progressive. I do not however condone millions of ungrateful layabouts and fanatics, hell bent on screwing as much as they can from their host countries and trying to overthrow and change the culture by sheer weight of numbers and social upheaval. I do of course realise that many immigrants are not of this ilk and do contribute invaluable input to the societies they have adopted. But far too many do not. Until we cap the numbers of those wanting to enter the more successful democracies of Europe, vet them all far more carefully, strengthen our borders and insist on much higher standards, I’m afraid Europe is doomed to a future beset with conflict and problems that will result in chaos, misery and ultimate capitulation. Unfortunately I feel it is already far too late. Sorry also, that I can’t reply to most missives, but I do read ‘em all – promise. Graham, if you’re so integrated, why do you never refer to Spanish current affairs in your pieces? You ARE an immigrant, & plenty of Brits here DO expect Spain to change for them (like, speaking English to them because they’re too lazy to learn Spanish). Also, asylum-seekers do not get benefits (35GBP p/w and locked on the premises). ‘Illegals’ get nothing, not even healthcare. Most refugees HAVE to enter illegally & govs understand that. How can Brian Eagleson possibly know that 90% of immigrants are fleeing starvation and death. Hs he counted them? Anyway, Leapy is not talking about them. He is talking about the ones that come to take advantage of our better way of life with their nike trainers and iPhones. The ones who leave their womenfolk and children behind. The ones who hate us and want to change our way of life. Ok Erica P, let’s look at the migrants who ‘take advantage of our better way of life’ as you put it. What do you think British expats do when they migrate to Spain? Have you noticed the ‘better way of life’? The way the money goes much further? Eating out all the time because the menu del dia is so cheap and the housing is much more affordable? Two sides to the same coin Erica. Now just imagine instead of being lucky enough to be born British you were born in almost any African or middle eastern country you care to name. Would you prefer to stay in a mud hut or corrugated iron one with no electricity, no running water and no sanitation? Of course not! Just like Leapy, you wouldn’t tolerate such conditions for a moment. You’d be out of there like a shot! You would be an economic migrant. The hypocrisy of people like you and Leapy is breathtaking! How can you possibly compare the vast numbers of British citizens, who emigrate with their pensions and life savings to spend, to Spain (thus bringing immeasurable prosperity and employment); who deservedly enjoy reciprocal medical services due to the fact that they have paid into our National Health Insurance during their working lives; who share and respect their mutual Christian religion, and, to my knowledge have never tried to change it or interfere with any Spanish festivities or traditions including Christmas and The Three Kings, with the economic immigrants that Leapy is referring to? Leapy, himself, took K40 with him in 1983 (worth a great deal more then); has worked hard and paid his taxes with never a hand out. Apparently, he speaks Spanish and some Catalan. Your comparisons are utterly ridiculous. I suggest you read the piece again. Erica, one of the core ‘Christian’ values is compassion. Most Brits know the parable of the good Samaritan – the man from the hated region of Samaria who goes to the aid of someone in distress while everyone else walks by on the other side. So where is the compassion in keeping out refugees and impoverished migrants at all costs? There is none. People with no compassion for others less fortunate than themselves are by definition inhumane and self-centred. That’s why the world we live in is do divided – so full of anger and strife – because it’s mainly run by self-centred people with no compassion. Unfortunately in the real world compassion has to operate in tandem with logic. It would be lovely if the UK could offer a home to every migrant who expressed a desire to go there to better themselves or have a better life than they have now. If Brian has his way I presume there would be an open door policy for anyone who was worse off than ourselves. That is millions and millions of people round the world. 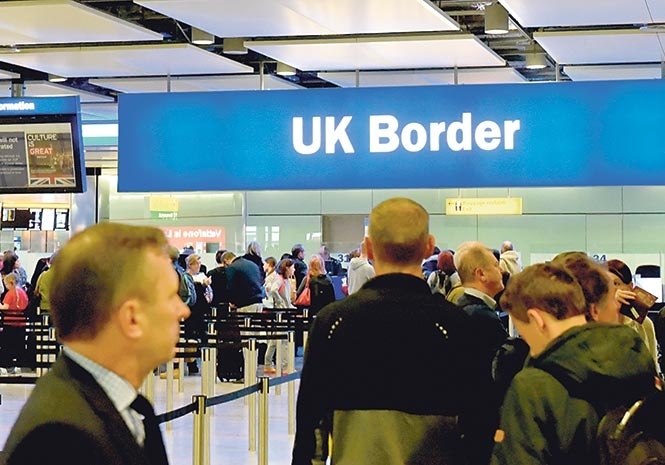 As soon as this compassionate open door policy was introduced, the floodgates would be opened and the UK would not be able to cope with the numbers and huge impact and cost to services and budgets. It would be a nightmare and totally impractical. Idealists respond to that by saying ‘oh the government will just have to plan for that’ which is a lazy answer and fiscally very dangerous. Multiculturism is not the same as integration so that would be a challenge too. Compassion is a great characteristic, but it cannot be unlimited. John, are you actually Leapy himself? Erica certainly was!